In manufacturing of pre mixes and mixtures for nutrition of livestock in manufacturing of replacements for milk skimmed and liquid nutrition for nutrition of animals. 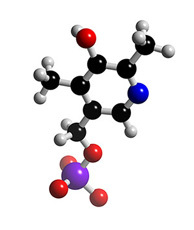 Vitamin B 6 (pyridoxine, adermin) like other vitamins within B Complex, belongs to a group of vitamins soluble in water, it cannot be deposited in an organism in more significant quantities due to which it is necessary their frequent bringing into an organism, in order to avoid deficit of the same. Vitamins soluble in water are extracted through urine. Lack of vitamin B6 causes slow growth of animals, lessening of appetite, anemia, spasms, changes on the skin, rough hair, which are signs of pellagra. Sources of this vitamin are yeast, milk, grains of cereals. Product is rather stable on the air, if protected from moisture. Temperature in the storage ought to be bellow 25 C. Packs opened ought to be used up very quickly. In the course of the use of the product inhalation of powder ought to be avoided and use of the protective measures and personal hygiene are to be ensured. Packaging - Cardboard packaging of 25 kg. Manufacturer - DSM Nutritional Products Europe Ltd.